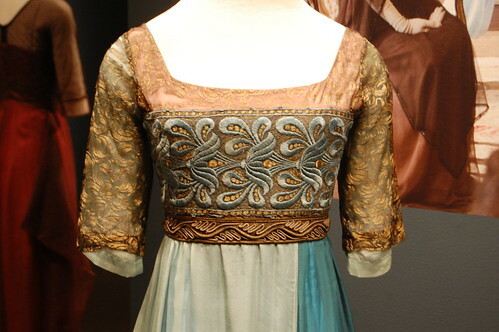 Last night, I uploaded a bunch of photos to Flickr, including photos from my visit to the Winterthur Museum in Delaware, to see the Costumes of Downtown Abbey exhibit. I had meant to sit down and write a post about this trip, but I didn’t get to it. So instead I will point you to Danielle’s post, and just say a few things. What I most enjoyed about this was the chance to see “movie magic” in reality. The costumers for the show have just seven weeks to prepare all the clothing needed for each series, for every character. They are not on a budget that allows them to go entirely vintage, even if they could find enough pieces. This means that many of the pieces are a combination of old and new. Some things they rent, which means the dress will pop up elsewhere on movies and TV. (Here’s a Dowager Countess example, a Cora example, and a Mary example.) Somethings have a vintage element that they built on, like the outfit featured above – the bodice is vintage (even in the photo you can see damage at the shoulder because the fabric is so delicate) and the pants are modern. And some things are entirely new. The other interesting thing was that you could see the corners cut that you’d never notice on television – unfinished hems and the like. Absolutely fascinating and a very enjoyable afternoon. In a very unusual move for most museums these days, they allow photography. While they didn’t prohibit flash, I mostly didn’t use it. I was also photographing quickly as my main focus was on enjoying the pieces in person, so not all of my photos of this are that great. But they will get the idea across and share a few of the things I found most interesting.